The town of Chester's Mill, Maine, is suddenly covered by a dome, an invisible force field on a normal, autumn day. A small team of honorable townspeople stand up to try to figure out what is happening, and why, only to draw the attention of Big Jim Rennie, a loud-mouthed town politician. Is the dome truly the largest threat facing the town? billyminersbooks (Lukeville ): Stephen King fans will love this book. The size, over a thousand pages, won't daunt anyone who read "The Stand" or "It". It's King at his best; a Maine town full of interesting characters, both good and bad; a fight between evil and good; tales of corruption and insanity.The premise is simple- what happens if a small town is suddenly submerged under an impregnable dome? The slow realization of what it means as the townspeople struggle for supplies, power and ultimately for air, makes for a great read. The interaction of the characters is what makes it a great King book. Scribner, November 2009. First Edition. Hardcover . Very Good/Fine. Signed by King on title page. Very slight crease to front flap of dust jacket. New York, London, Toronto, Sydney: Scribner, Publisher, 2009. Limited signed edition of 1,500. From copyright: "This Scribner collector's edition November, 2009." Beautifully flat signed by Stephen King at front endpaper: "Stephen King". Black full cloth boards, silver embossed spine titles, fine. Horace Greeley, the feisty Corgi, blind-stamped at front board. Pages fine, and with the addition of a black satin ribbon marker; no writing. Pictorial map endpapers in color special to this edition. Fine bind; hinges intact. Dust wrapper fine; unclipped 200.00, protected in new clear sleeve. Classic wrap-around jacket art by Platinum FMD and design by Rex Bonomelli using a combination of illustration, photographs, and 3D renderings w/cover, spine titles, and publisher info being the only words on entire jacket. This special wrapper features wrap-around orange metallic half-jacket with the titles. This edition illustrated by Matthew Diffee. Features frontispiece and illustrated character vignettes before each chapter and also the matching collector cards with summary descriptions at back; preserved in small case. Re-live the story through the cards. Impressive finely crafted volume weighing in at over four lbs. An invisible and mysterious force field descends upon a small fictional town of Chester's Mill, Maine, USA, trapping residents inside, cut off from the rest of civilization. The trapped townsfolk must discover the secrets and purpose of the "dome" and its origins, while coming to learn more than they ever knew about each other. Don't be caught in Chester's Mill on Dome Day. King's epic novel continues the intrigue. On a beautiful fall day, the town of Chester's Mill is inexplicably and suddenly sealed off from the rest of the world by an invisible force field. No one knows what this barrier is and when - or if - it will go away. After the firmament seals off Chester Mills from the rest of the world, it is up to Dale Barbara, an Iraq veteran, and a select group of citizens to save the town, if they can get past Big Jim Rennie, a murderous politician, his son, who hides a horrible secret in his home, and a strange device at the center. "THE PERFECT AMERICAN SMALL TOWN... " 1074 pages. Large 6 1/2" x 9 1/2" x 3" design. Printed in the U.S.A. Insured post.. Signed by Author. First Edition. Hardcover. Fine/Fine. Illus. by Diffee, Matthew . 8vo - over 7¾" - 9¾" tall. Book. UK: Hodder & Stoughton. London, Hodder & Stoughton, 2009. Limited edition. One of 500 Copies, signed by the author in a slipcase with a pack of trading cards. A fine copy. . Fine. Hardback. Limited Edition. 2009. 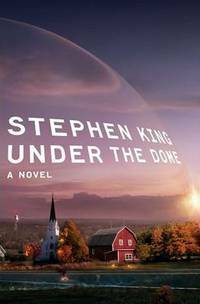 Under the Dome - A Novel. Hodder & Stoughton, London., 2009. First U.K. edition. Octavo. pp xiv, 1074.Signed by the author on the title-page.Very near fine in fine dustwrapper. Housed in a custom-made slipcase. Simon & Schuster, 2009. 1st Edition. Hardcover. This in one of the 1500 signed Limited edition. Signed by Stephen King. Complete with a belly band, a stamped case, four-color printed endpapers, a ribbon marker, and containing a set of 27 special trading cards featuring drawings of characters from the book (drawn by cartoonist Matthew Diffee). These drawings are featured in the book as a front piece image and on the 26 part title pages. Book and dustjacket is in Fine as brand new condition. Still in maufacturer's shrinkwraps. 2010-02-02. New. Ships with Tracking Number! INTERNATIONAL WORLDWIDE Shipping available. Buy with confidence, excellent customer service! First edition hardback, signed/limited edition (precedes the trade), one of reportedly 1,500 copies signed by King, a Fine copy in a Fine dust jacket, new and unread, still in publisher's shrinkwrap packet with limited edition trading cards included, and even the original shipping box. This edition (which was sold out before the end of the day it was made available for sale) includes a belly band, better paper than the trade, and full-color maps on the endpapers. This is one freaking huge book. Image shows another copy of the book still in shrinkwrap with cards attached underneath the wrap at top, as issued. This copy is still sealed in the original publisher's shipping box. Buyer agrees to pay an extra $7.50 for insured shipping. Scribner, 2009. 1st Ed. Hardcover. Near Fine/Very Good. Signed. SIGNED WITHOUT ANY INSCRIPTION BY STEPHEN KING! Mr. King's signature has been professionally authenticated by PSA/DNA. First Printing in lovely near-fine condition (mild bumping on upper corners). Attractive dust jacket with "Autographed Copy" sticker, price intact, looks terrific in new mylar. Expedited shipping is welcome; international will entail a considerable additional fee due to weight. Signed by author. SCRIBNER'S A FINE FIRST IN DJ. SIGNED BY KING. Signed. FIRST. 2009-07-07. New. Ships with Tracking Number! INTERNATIONAL WORLDWIDE Shipping available. Buy with confidence, excellent customer service! Signed by Stephen King. First Edition in Fine Condition I sell on Amazon under the name TrillyandTruly where I have a ton of positive feedbacks. 2009-01-01. New. Ships with Tracking Number! INTERNATIONAL WORLDWIDE Shipping available. Buy with confidence, excellent customer service! New York: Scribner, Publisher, 2009. First edition, eighth printing. Beautifully flat signed by Stephen King at title page: "Stephen King". Navy boards, textured spine wrap, silver spine titles, lt. shelf wear. Page near fine, no writing; slight page roll at back pages. Fine string bind; hinges intact. Dj fine; unclipped 35.00, protected in new clear sleeve. Classic wrap-around jacket art by Platinum FMD and design by Rex Bonomelli using a combination of illustration, photographs, and 3D renderings w/cover, spine titles, and publisher info being the only words on entire jacket. Rare, near fine signed example. An invisible and mysterious force field descends upon a small fictional town of Chester's Mill, Maine, USA, trapping residents inside, cut off from the rest of civilization. The trapped townsfolk must discover the secrets and purpose of the "dome" and its origins, while coming to learn more than they ever knew about each other. Don't be caught in Chester's Mill on Dome Day. King's epic novel continues the intrigue. On a beautiful fall day, the town of Chester's Mill is inexplicably and suddenly sealed off from the rest of the world by an invisible force field. No one knows what this barrier is and when - or if - it will go away. After the firmament seals off Chester Mills from the rest of the world, it is up to Dale Barbara, an Iraq veteran, and a select group of citizens to save the town, if they can get past Big Jim Rennie, a murderous politician, his son, who hides a horrible secret in his home, and a strange device at the center. "THE PERFECT AMERICAN SMALL TOWN... " 1074 pages. Large 6 1/2" x 9 1/2" x 3" design. Printed in the U.S.A. Insured post.. Signed by Author(s). First Edition. Hardcover. Very Good/Very Good. 8vo - over 7¾" - 9¾" tall. Book. New York: Scribner's, 2009. First Edition. Hardcover. Fine/fine. Octavo, 1074pp. A fine, crisp, unread copy in like dust jacket. SIGNED by King on the title page. Scribner. Near Fine in Near Fine dust jacket. 2009. First Edition; First Printing. Hard Cover. 9781439148501 . SIGNED and inscribed on front endpaper, "For Sylvia - with lots of good wishes - Stephen King." Tight, clean and crisp. A gently read book in excellent condition. No remainder mark. Not price clipped. Not ex-library. Protected in a new Mylar cover. ; 2.6 x 9.5 x 6.5 Inches; 1074 pages; Signed by Author . New York: Scribner, 2009. Book. Fine. Hardcover. Signed by Author(s). 1st Edition. 9&1/2" by 6&1/2". Dark blue binding with silver title, clean and tight, 1074 pages, inscribed by author to former owner; jacket is clean and bright. New York: Scribner's, 2009. 1st Edition. Hardcover. New/new. 1st Edition. Hardcover. Special Illustrated collector's edition. Includes collector's cards with illustrations of characters, 4 color printed endpapers, ribbon marker, housed in custom slipcase and a wraparound band on the dust jacket. Still in publisher's shrinkwrap. First Edition, Printing. 1 3 5 7 9 10 8 6 4 2. This book went from, the now closed, B&N @ 2703 E Camelback Rd. Phoenix Az. 85016, stored into a box. See pics for details. I had no intent of saving it for any reason. Please ask for more info. I often charge for than the rest, because I believe I have better. I'll take any pics and even add a story of how I aquired them... Might take my memory a few days. But the pics do the walking. I the talking. I offer this as mypersonal book. If you find better, then buy it. I only provide offers as local auction houses reccommend. For some of these bookI ask very high prices. And so I will provide high service. New York: Scribner, 2009. Quarter blue cloth over paper boards. Octavo. Light wear to board edges and a few light scuffs to the rear board. Dust jacket with a few creases in the edges, light wearto rear upper edge but overall a good, clean copy. Signed by King on the title page. . Signed. First Edition. Hardcover. Very Good/Very Good. Scribner. King, Stephen. Under the Dome. NP: Scribner, 2009. Special Illustrated Collector's edition. Illustrated. 8vo. Hardcover with slipcase. Book condition: Fine in original shrink wrap. Slipcase is near fine. Dust Jacket Condition: Fine. Special edition set includes collector's cards with illustrations of characters in the book, 4-color printed endpapers, ribbon marker, and is printed on specialty paper. . Fine. 2009. 2010-01-01. New. Ships with Tracking Number! INTERNATIONAL WORLDWIDE Shipping available. Buy with confidence, excellent customer service! 2013-06-06. New. Ships with Tracking Number! INTERNATIONAL WORLDWIDE Shipping available. Buy with confidence, excellent customer service! First Edition. First Scribner Hardcover Edition 2009 and full number line stated on copyright page. Not price clipped. Back DJ just above the barcode is #1109. Book in very good condition with only shelf wear and DJ in good condition with small pinhole tear and scuff on back cover. Pages are crisp and clean. Pp. 1074. Comes from private smoke free collection. 2013-05-06. New. Ships with Tracking Number! INTERNATIONAL WORLDWIDE Shipping available. Buy with confidence, excellent customer service! New York: Simon & Schuster, 2009. Book. Illus. by Matthew Diffee, Paul J. Pugliese. Fine. Hardcover. First Edition/First Printing. A solid square clean un-read un-opened as new copy still in publisher's shrinkwrap. This copy being one of 10000 released of the Collector's Set. The Collector's Set includes a set of 27 cards designed and drawn by Matthew Diffee, 4-color printed endpapers which depict the area in which the novel takes place is drawn in map form by Paul J. Pugliese, wrap-around jacket art is based on photo by Ray Brown, a gold belly band which is part of the jacket and a sewn in silk book mark. THIS COPY IS IN MY POSSESSION AND NORMALLY SHIPS NEXT DAY. .
Old Tappan, New Jersey, U.S.A.: Scribner, 2009. 1st Edition . Hardcover. Near Fine/Very Good+. 8vo - over 7¾ - 9¾" tall. The inhabitants of a small Maine town are cut off from the outside world by an invisible barrier that drops from the sky. A beautiful copy! Correct full number line sequence. No writing, marks, underlining, or bookplates. No remainder marks. Spine is tight and crisp. Boards are flat and true, and the corners are square. Dust jacket is not price-clipped and shows only minor shelf wear to the edges and a small (1/4") tear to the upper left side of the back cover. This collectible, near fine, first edition/first printing copy is protected with an archival mylar dust jacket cover. Satisfaction guaranteed! 2014-08-04. New. Ships with Tracking Number! INTERNATIONAL WORLDWIDE Shipping available. Buy with confidence, excellent customer service! 2010-04-03. New. Ships with Tracking Number! INTERNATIONAL WORLDWIDE Shipping available. Buy with confidence, excellent customer service! 2009-01-05. Good. Ships with Tracking Number! INTERNATIONAL WORLDWIDE Shipping available. May not contain Access Codes or Supplements. May be ex-library. Shipping & Handling by region. Buy with confidence, excellent customer service! 2014-01-06. New. Ships with Tracking Number! INTERNATIONAL WORLDWIDE Shipping available. Buy with confidence, excellent customer service! 2013-07-04. New. Ships with Tracking Number! INTERNATIONAL WORLDWIDE Shipping available. Buy with confidence, excellent customer service! Bungeishunju/Tsai Fong Books. Hardcover. 4163804803 Please allow 4 - 14 business days for Standard shipping, within the US. Thank you for supporting our small, family-owned business! . Fair. 2011-04-01. 2009-08-07. New. Ships with Tracking Number! INTERNATIONAL WORLDWIDE Shipping available. Buy with confidence, excellent customer service! 2009-01-07. New. Ships with Tracking Number! INTERNATIONAL WORLDWIDE Shipping available. Buy with confidence, excellent customer service! 2010-07-05. New. Ships with Tracking Number! INTERNATIONAL WORLDWIDE Shipping available. Buy with confidence, excellent customer service! 2011-06-05. Good. Ships with Tracking Number! INTERNATIONAL WORLDWIDE Shipping available. May not contain Access Codes or Supplements. May be ex-library. Shipping & Handling by region. Buy with confidence, excellent customer service! 2010-02-02. Good. Ships with Tracking Number! INTERNATIONAL WORLDWIDE Shipping available. May not contain Access Codes or Supplements. May be ex-library. Shipping & Handling by region. Buy with confidence, excellent customer service! Simon &amp; Schuster Audio, 2013. CD-Audio. New. 5.75 x 5 cm. 2011-04-01. Good. Ships with Tracking Number! INTERNATIONAL WORLDWIDE Shipping available. May not contain Access Codes or Supplements. May be ex-library. Shipping & Handling by region. Buy with confidence, excellent customer service! Large Print Press, 2010-07-06. Lrg. Paperback. Used:Good. 2010-07-06. Good. Ships with Tracking Number! INTERNATIONAL WORLDWIDE Shipping available. May not contain Access Codes or Supplements. May be ex-library. Shipping & Handling by region. Buy with confidence, excellent customer service! Scribner. Hardcover. 1439148503 Un-clipped dust jacket Book is in very good condition. -- Re-Read is a social enterprise that trades in and recycles books to reduce waste, save them from landfill and provide services and activities that promote literacy, education attainment and quality of life in South Yorkshire and supports Askern Community Library. All overseas shipping is via Airmail. . Very Good. 2009. 2009-01-07. Good. Ships with Tracking Number! INTERNATIONAL WORLDWIDE Shipping available. May not contain Access Codes or Supplements. May be ex-library. Shipping & Handling by region. Buy with confidence, excellent customer service! 2010-01-01. Good. Ships with Tracking Number! INTERNATIONAL WORLDWIDE Shipping available. May not contain Access Codes or Supplements. May be ex-library. Shipping & Handling by region. Buy with confidence, excellent customer service! First thus, published simultaneously with hardcover First Edition. Still in publisher's original shrinkwrap. Includes collector cards with illustrations of characters in the book, 4-colour printed endpapers, ribbon marker, printed on specialty paper. Chapter heading illustrations by Matthew Diffee. 1,072 pages + Author's Note.